Avocado oil is extracted from the avocado fruit pulp. The avocado plant originated in Central America but over the period of time it has spread over to warm subtropical and temperate regions of the world. Avocado fruit is grown for fresh fruit market, for either domestic consumption or export purpose. Avocados have different varieties, of which ‘Hass’ and ‘Fuerte’. Hass is largely cultivated in New Zealand and provides high yield and low postharvest disorders. Australia in 2017 was one of the highest exporters of Avocado with Malaysia and Singapore being the largest export destinations. But the free trade agreement between Chile and China is imposing stiff competition on Australian exports to Hong-Kong. The high content of healthy fats, thiamin, riboflavin and vitamin A, E, K is majorly driving the growth in demand for Avocado oil all over the world, which is useful not only in cooking purpose but also in beauty and cosmetics products to reduce blemishes, dry skin, wrinkles, and acne. Further, various technological improvements are being implemented in the Avocado production to increase the yield and reduce pest impact. In 2017, total avocado production area in Mexico was increased by 7.3% on the back of rising domestic and international demand for Hass avocado. Globally avocado oil consumption is continuously increasing backed by improving trade relation of different countries with Central America. Avocado oil is expensive as compared to other oils like olive oil and coconut oil, thus the price majorly hinders the growth of the market. Goldstein Research analyst forecast that the Global avocado oil market is set to reach nearly 2100 thousand tons by 2025, growing at a CAGR of 12.8% over the forecast period (2017-2025). Extra virgin avocado oil accounted for the largest market share of 28.3% in 2017 on account of its extraction process that ensures the highest quality of the avocado oil and has no additional additives. Based on geography, North America accounted for the largest market share of 58.6% in 2017 based on the production of avocado oil. On the basis of consumption, Asia-Pacific region accounted for the largest market share in 2017 with Malaysia, Singapore, and Hong-Kong being the top consumers. Asia-Pacific region is expected to grow at fastest CAGR of 14.8% over the forecast period based on consumption and production. The report covers the present ground scenario and the future growth prospects of the avocado oil market for 2017-2025 along with the market players’ analysis. We calculated the market size and revenue share on the basis of revenue generated from major players in the Global region. Global Avocado Oil Market Outlook 2017-2025, has been prepared based on an in-depth market analysis from industry experts. 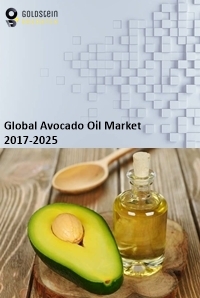 The report covers the competitive landscape and current position of major players in the Global avocado oil market space. The report also includes Porter's five force model, SWOT analysis, company profiling, business strategies of market players and their business models. “Global Avocado Oil Market Report” also recognizes value chain analysis to understand the cost differentiation, pricing models to provide a competitive advantage to the existing and new entry players. Our Global avocado oil market report comprises of the following companies as the key players: Bella Vado, NOBEL FOODS, Sesajal, CHOSEN FOODS, ACADO, AMD Oil Sales, BIO PLANÈTE, Kevala, Avoolio, LA TOURANGELLE, Storino's, Olivado, etc.